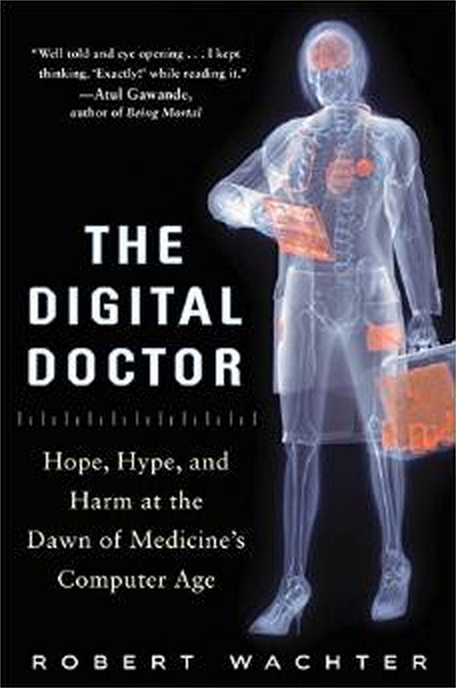 This week feels like the coming out for my new book, The Digital Doctor: Hope, Hype, and Harm at the Dawn of Medicine’s Computer Age. The NY Times ran my op-ed on health IT today (they chose the slightly sensationalist title, FYI). I’ve also started something of a book tour, with several talks and media interviews scheduled this week, including a sit down with Sanjay Gupta. (Note to my wonderful children: sorry, no Jon Stewart; at least, not yet). The topic – the unanticipated consequences of health IT – appears to resonate with audiences, both lay and professional. The Times story been retweeted nearly 500 times (Atul Gawande’s generous tweet has itself been retweeted almost 200 times). At this moment, the story is the second most emailed piece on the Times website. By the way, if you’re interested, here is a short video I did on the book’s major themes. OK, comment away if you’re game. I will read them all and respond when I can. Very interesting statistic that 6% of the reported medication errors between 2003-2010 were related to computerized prescribing systems. What is the citation for the study that information came from? Thanks! testing of current systems. BMJ Qual Saf. 2015 Apr;24(4):264-71. Congratulations on your 175 degree turn…almost 180 degrees…getting there. You took the words right out of my mouth. HIT: still laden with hype and harm and more problems than the hollow promises can overcome. But the problem in resolving the adversity is 1. the failure of the industry to recognize that their devices are devices and 2. their having successfully deceived Congress with the (erroneous) notion that the vendor spawned certification programmed aka C$HIT was a safety surrogate, when it was anything but that. Congrats on a crystal clear description of some of the salient harm resulting from the non-stop flight to “meaningful use” of health care IT, a tool with its origins deep in the meaning challenged “coding for billing” IT generation. The still uncharted fine structure of patient-physician encounters will remain the core of health care after the current push to reduce them to consumer-provider countertop transactions ruled by simple shopping mall logic. We shall return to what we all know but medical education has tried to sidestep since before Flexner: there is a lot more to medicine than memorizing all those lists, doing as we saw our teachers do and staying ahead or regulatory mandates. How does the tool help to prevent and/or correct the third leading cause of death in the U.S.? The impact of medical errors on mortality, morbidity, cost of care and quality of life is staggering. Errors such as the example you quote, misreading “mg/kg” as “mg” are admittedly hard to prevent when both physician and pharmacist ignore opportune strident alerts. However, beyond that type of error, we must recognize that we are misdiagnosing frequently enough to maintain a thriving malpractice litigation and insurance industry, discharging patients prematurely at significant risk and cost, and otherwise driving with our diagnostic and management decisions the expenditure of a couple of trillion dollars a year by a stressed system delivering results inferior to those of other developed countries. Unless we are willing to concede that as a group, U.S. doctors are either refractory to training or engaged in a national plot to fail, we would do well in reviewing where do our decision making skills, our diagnostic practices and our management protocols come from. Practically every medical school brochure heralds a commitment to the creation of “medical scientists”. Is that goal reconcilable with our performance? Could it be that the Flexner’s hundred+ year old recipe of a couple of premedical courses in math, physics and chemistry, followed by the memory marathon and rushed clinical boot camps of medical school and the continuation of same in residency is admittedly “a hard test” but just not equal to the complexity of the problem today faced several times an hour by typical physician? The fact is that the mind and knowledge of an average student capable of completing today Flexner’s still current program probably would have been still overqualified for the treatment of myocardial infarction patients in 1960, when their management was the same as that prescribed for sciatica patients: bed rest and morphine as tolerated. Since then, fortunately, our understanding of disease and the resulting technological diagnostic and therapeutic breakthroughs have made medicine much more effective. Unfortunately, they also have transformed our decision making theater into a large and expanding space where numerous dynamic entities lead to even more numerous possible diagnostic and management options. Safe and efficient decision making in this environment is not even addressed in the medical education experience packed with memorized lists, rules of thumb, customary (and unconfirmed) practices and other decision short cuts. If tackled with awareness of the complexity and of what is at stake, today‘s typical clinical decision making problem is orders of magnitude more complex than the average bench research experiment in which trained scientist toil for months or years while holding all but one or two variables tightly controlled. The simplest of “chief complaints” may well appear to “match perfectly” one of “the ten most common_____” recorded on the index card, smart phone or IT network used by the physician. However, a responsible decision actually requires two indispensable yet persistently unrecognized decision aids: 1) The patient’s data base as a decision support information management system for the timely storage and retrieval of all the information pertinent to the case (from demographics to the result of diagnostic and therapeutic interventions) and 2) A combinatorial analysis utility that will explore and rank by diagnostic likelihood all the points of intersection between current medical knowledge and the patient’s data base. All of the above is nothing but what Professor Larry Weed has proposed during the last five decades: The Problem Oriented Medical Record, an organizing concept that has been extensively validated as a key contributor to quality, safety and efficiency of care. POMR provides a framework for the organization of the patient’s data, the definition of active problems, the physician’s rationale for diagnostic or treatment interventions, the goals of each intervention, the patient’s input and the documentation of progress. Unfortunately only the latter, Weed’s re-structuring of the traditional “Progress Note” into the SOAP format has had any significant penetration and endurance. As more and more billions of dollars change hands around the Electronic Health Record initiative, we are witnessing the modernization of poverty instead of the long overdue revision of the “time-disproven” old approach to documenting and analyzing the informational basis, the events and the rationale involved in patient-doctor encounters. The data base and information handling methodology without which any diagnostic or management decision has a significant likelihood of being in error is now digitized and displayed on computer screens, but it remains fragmented, outdated, disorganized, impractical to review and cumbersome to share with those in a need to know. Beyond that, it actually creates new opportunities for medical errors. Based on observations from the introduction and validation of POMR, Professor Weed went on to create Knowledge Couplers, relatively simple combinatorial analysis tools capable of fast and reliable sorting out the numerous data points brought to the surface by examining the intersections between the patient-specific data base (POMR) and the current knowledge files. Of course, the reliability of these decision aids rests on the completeness and care-friendliness of the POMR. As we watch and suffer the introduction of so much hype and harm under the guise of progress, it has never been more urgent to revisit Professor Weed’s work. Most of us already know the folly in insisting on the same old approach while expecting different results. Your book may make us realize that a digitized version of the old broken approach will be much harder to fix. My father Robert and I both enjoyed Professor Larry Weed MD guidence and innovation in medical care. You are right!! We need him again! That may all be true, but the best predictor of your patients’ health status and their likely prognosis is still their ZIP code. I have no idea what that means in regards to our IT nightmare. How can we organize our work so that we don’t spend hours doing the data entry of MU, CPT bullets, ICD coding, PQRS, etc? As long as bureaucrats and insurers require that doctors do clerical work, there is no solution to the problem. And no, hiring a full-time scribe for every practicing physician in the country is not a long term solution. Robert, you are quite right, we are starting to “realize that a digitized version of the old broken approach will be much harder to fix.” The time to organize our work was BEFORE the billing department (pushed by Blue Cross&friends) hijacked the entire clinical operation, effectively outsourcing clinical thinking to the predecessors of EPIC&friends.However, it s not too late, but to get anywhere we are going to need more physicians interested in good efforts like Wachter’s Op-Ed piece. So far only five comments? Why the deafening silence? I have to agree with the comment above by Robert. We have EHR systems which tie doctors and nurses to computers and prevent them from interacting as desired with patients. Why not design a system, documentation and coding rules which aid this interaction rather than hinder it, instead of expecting physicians to accomplish this “despite the demands of the computer”? Surely the system does not need coding books that are larger than some general medical textbooks and documentation demands that make charts unreadable. Surely a system can be developed where the amount of time spent gathering information is not exceeded by the time spent documenting it. Doctors didn’t go into this to be data entry clerks, it’s the system that forces them to be. Doctors and nurses in many places are no longer “yoked to the nurses’ station by a single paper record”, they are yoked to computer screens. From what I’ve seen, nurses have documentation requirements that are as onerous as those of physicians and detract just as much from patient care. “New ways to build teamwork” sounds great but just what do you have in mind that will accomplish this? As far as federal policies to “promote seamless sharing of data between different systems”, the government tried to get the Department of Defense medical record system to seamlessly interface with the VA system, and were not successful. This was one government working with two related medical systems that they fully control. How do you expect the private sector with multiple vendors scrambling for a niche in the market to cooperate? I hope this can be done but I think it’s a pipe dream. 1) Look to your procurement practices. In every other information-intensive industry, systems designers and implementers always work with the major users. They are driven by and must support the information and process requirements of the client. In the healthcare industry, by contrast, the clients (i.e., those who procure your information technology) are led around by the nose by the vendors (“We’ll tell you what you need. Trust us.”). What you perceive as lacking in the support your IT/IS gives you in the ability to do your job is not the fault of the “programmers” or the “designers”, but rather it IS the fault of those who hire them and buy their products and services. 2) If the data that are collected in your information systems are intended to be analyzed by researchers to determine “what works” and evidence-based practices, then your systems must be designed to include that capability. It’s not an either/or proposition but a “both-and”. 3) What “Medical Director of Information” or CFO ever was fired for hiring Epic? Nurses are having a hard time taking care of their patients. There has been a radical disruption in nursing workflow with many therapies and tests delayed and NOT DONE. Your solutions are vapid. You propose training to focus on the patient. Really now, that is a pathetic recommendation considering that we always focus on the patient but the med tech systems prevent us from doing so. Get real. You have promoted these systems in your blog, and now, you are selling your boo describing the complaints about med tech that others have issued for several decades. Where were you 5 and 10 years ago? Med tech systems are the ultimate gatekeepers, creating impediments to doctors desperately trying to take care of their patients. Your recommendation to change the work force and culture is folly. The technology is already unleashed. Its interference with care is toxic, killing many, and injuring more. Suzy, rn…I never met or even heard of Dr. Wachter until his Op-Ed piece, but before anybody dares to call his suggestions “vapid” and “pathetic” I would suggest that we lower the temperature of the old and growing nurse-doctor antagonism. There are many reasons for the death of the team spirit, but one thing is certain: it will not get better if we are not willing to listen to, let alone consider the suggestions of people who have true expertise like the host of this blog. I believe all of us in health care have to answer your question as to our whereabouts “5 and 10 years ago”, but I have news for you, many were sounding the alarm for the last few decades, and they have the scars to prove it. It should come as no surprise that some of us, having heard those alarms, are not willing to give up just yet. we need to cancel out the aggressive ignorance prevalent in ALL chaotic and rudderless systems, not just in health care. I don’t think Suzy rn is being antagonistic to doctors. Nurses are burdened as much by the EHR as are doctors, if not more so. We’re both in this together. Dave, after thinking about it, I see your point: if facing a crisis one victim call another’s suggestions “vapid” and “pathetic” is… just another way of keeping the traditional collaboration alive. Ricardo, I think Suzy rn is just calling it as she sees it, and not because the suggestions came from a doctor. Certainly nobody disagrees that doctors and nurses should focus on patients, that it would be great if different medical record systems interfaced seamlessly, and if doctors and nurses had better teamwork. (It would also be great if we could cure metastatic pancreatic cancer, if our health care costs would decrease by 50%, and if patients would never code unexpectedly). These are not “solutions”, they are goals which the systems that health care workers use should facilitate and which currently do not. At issue is the fact that current systems are designed mainly for coding and billing and were not developed primarily for what most of us consider our primary task, which is patient care. Also, Dr Wachter has been an avid proponent of the benefits of EHR previously. The one PRACTICAL suggestion which was proposed was to have software designers pay attention to workers who have to use the system, and test the products thoroughly before they are released, and IMHO academic researchers are NOT the people to develop the products with. Suzy, please correct me if I’m wrong, but it’s not a doctor/nurse thing. She strikes me as a front-line nurse who is frustrated by a system which keeps her away from her patients documenting useless reams of things which nobody ever reads, and which forces her to give worse care than she optimally could with a better system. Thanks Dave, with sincere apologies to the numerous-not others who actually commented on the Op-Ed piece, I will digress from the main topic to try to get something out of our sidebar on Suzi’s entry. I don’t really think that the authorship by a doctor motivated her when she fired “vapid”, “pathetic”, “get real”, “You have promoted these systems in your blog, and now, you are selling your boo describing the complaints about med tech that others have issued for several decades”. On the other hand, such style of discourse is common when humans find themselves in stressed out environments, particularly when no resolution seems within reach. If the health care encounter environment today does not fit that description, we need to redefine both “stress” and “resolution”. Today’s practice environment is full of “no-way out” messages, adding to the stress by giving the staff the impression that “it will never get better”. Things like “do more with less” “the computer is crazy, but it is what we have to do” “regardless, must ace the JACHO core measures” “layoffs are a clear possibility” and “your efficiency is below our target”. You may have had a different experience, but in 30+ years of practice in high-end stress clinical practice I have noticed non-productive and unjustifiably aggressive blame-shifting outbursts by doctors, nurses and by those who carry the heaviest burden: patients. Specifically regarding the nurse-physician dyad, the power structure inherent to each role (yes, it is true, doctors’ orders are mostly carried out by nurses) is a source of tension. In addition, since neither doctors nor nurses are educated, trained, licensed or employed with specific attention to kindness, thoughtfulness and understanding of other people’s points of view, the typical interaction whenever the stress level reaches the variable saturation point has an unproductive tone and content. All too frequently, if the physician grunts something like “You need to give Mrs. X another bolus”, the stressed nurse replies with something like “I can only do five things at the same time”. In fact, this is such a long standing tradition, that nowadays even if the physician states something like “when you get a chance, could you please give Mrs. X a 500 cc saline bolus?”, the nurse replies “Put it in the computer! I can only do ten things at the same time!” Obviously we all share the responsibility to avoid unproductive exchanges, most of all, because as Dr. Wachter’s piece illustrates, we have much bigger fish to fry. Finally, the fact that Wachter has promoted these systems in the past does not invalidate this critique of what they have become. In fact, it makes it more noteworthy and significant. Look to your procurement processes and the people with the authority and responsibility to hire the vendors and to document your information and process requirements for them and demand that they support your organization’s requirements. If they are letting the vendors tell them what your organization needs, rather than the other way around, then change those people. If they are using the excuse that “we have to compete with the other healthcare systems that hire these vendors” (even though everybody in every healthcare system complains that their systems don’t support them in doing their jobs, especially the frontline workers), then you should demand that they develop a spine and support the people who carry out your organization’s mission rather than the vendors’ bottom line. What is being offered here as “solutions” indicates that our thought leaders don’t even know what the problem is. This is exactly the kind of fuzzy thinking that got us into this mess. I don’t see things getting better any time soon. Ricardo, actually I’m not disagreeing with you, it is indeed good that Dr Wachter, who has a lot of clout and influence, is bringing to attention the faults of EHR. Indeed there are some things that EHR does which are great. Thirty years ago I spent a lot of time going through old paper charts to access previous x-ray reports, labs, and discharge summaries, and these are now available instantaneously. In the VA system, a note written in Tampa, Florida, can be accessed immediately in Seattle, Washington, so this type of access is possible. However, the faults are many. Medication interaction alerts are a great idea but when you get an interaction alert on every medicine you put in, they lose their effectiveness. I won’t go into the myriad other problems. However, Dr Wachter is also in a position to offer some effective solutions, not platitudes. From what I’ve seen, although doctors and nurses may not be specifically ” educated, trained, licensed or employed with specific attention to kindness, thoughtfulness and understanding of other people’s points of view”, with some exceptions they as a whole tend to exhibit these qualities as well or better than any other group of people, and those that don’t gravitate to fields with limited patient care. To tell a nurse or doctor in the trenches who is struggling to focus his or her care on the patient that the solution is to better train doctors and nurses to focus on the patient despite the impediments put in their way is, I think, somewhat insulting at worst and unhelpful at best (and I think explains some of the rancor seen in Suzy RN’s note). Perhaps, however, Dr Wachter’s book deals with solutions better than an op-ed piece can do. “Academic researchers” in this area as well as the software developers should heed the input of the rank and file workers, and o his credit he has invited comments from us in this blog. Dave, so as to not open ourselves to criticism for having hijacked Dr. Wachter’s platform into “Dave&Ricardo’s chat room”, let me close by saying that you are entirely correct in your appreciation and I agree with your point of view. Our stressed system faces an undeniable crisis compounded by an abundance of mediocre IT “solutions” contributing mostly e-ballast. As we search for real solutions, let’s consider: 1) If a 2015 suggestion to improve a medical education system that has not been revised since 1910 is received as an insult, there may be more than meets the eye. True, since 1910 an avalanche of new information and a good deal of knowledge have been ADDED to the curriculum, but to press on without examining teaching and training is like adding rungs to an antique ladder instead of using the new elevator. 2) That a progress note (regardless of its variable relevancy to safe and effective care) is now available instantaneously one thousand miles away is quite a feat. However, simply speeding up the product of any system requires examining it first, redesigning outdated methods and counterproductive steps. Raw speed and ease of transmission of medical error-prone notes and orders may be the best example of “bad news travels fast”. May the force be with us, the situation certainly requires it. Thank you for your excellent Op Ed. Nice book. Thanks Dr. Wachter for giving a free signed copy of your new book in SHM15 meeting. I am going to read it cover to cover as soon as I reach home. Hope to learn a lot. I look forward to your talks at SHM’s annual meeting. This year’s talk was no exception especially given my own experience at configuring and implementing health IT. I was particularly glad you pointed out one of the many unintended consequences of HIT that I noticed over the span of my own career, that of the loss of Radiology Rounds. I personally look forward to the opportunity to collaborate with our radiologists whenever possible despite the relative “inefficiency” of this practice. While I appreciate the eloquent voice of caution you bring, it concerns me that you repeatedly gloss over the benefits of HIT and its role in eliminating of many of the errors inherent in our previous paper and manual processes. I’d love to hear more about what you have learned are benefits to this transformation that continues to gain momentum. Please stop showing the cartoon drawn by a 7 year old and using the term “cream of the crap”. The latter in particular strikes me as a cheap joke at the expense of the thousands of well intentioned technical and clinical people striving to improve care by modernizing it. Please use your voice to help encourage us all to do a better job in designing, selecting, implementing and optimizing these powerful tools. I hope your future writing and speaking on this topic will paint a more optimistic picture. Just finished reading your book. It is excellent. Smoothly written, candid, realistic, charitable, comprehensive. Will be reviewing it on my blog shortly. Will it? I presently work in a 25 bed critical access hospital, only some 3 hours North of you. We struggle with this issue all the time. For example in OB we only have 15 deliveries a month-low volume and hard to keep good docs and nurses. But when the next hospital is 2 hours away, what is the alternative? In this age of IT and interconnectiveness, why can’t a 25 bed rural hospital have as good an outcome as an academic center? Bob, I know you are well travelled, but I wonder how much time you spend observing rural healthcare. If the professors don’t get out into the boonies, is it surprising that newly trained docs don’t either? Bob, I wonder if we have identified the factors that explain the outcome gap between academic medical centers and small hospitals like yours. Academia does come with a great deal more formal knowledge and with a higher patient acuity and volume which obviously impact the quality of the care environment.Additionally, there is also the very positive impact of more manpower and resources available to prevent and identify medical errors. Nation-wide, medical errors are the third leading cause of death. We have no reliable data on the morbidity impact of medical errors, but it is likely to be very significant and would certainly affect outcomes. Could it be that one important factor behind the outcome gap is the manpower/resource gap which allows academic centers to identify and prevent a larger fraction of medical errors? Well done. Your book is an important step in developing a conceptual framework for the continued transformation of our profession. Upon my recent retirement as CEO of Providence in Seattle, I had a similar epiphany regarding the lack of strategy for the use of the EHR. I worked with Ram Charan, a long time mentor, to look at other industries that have been transformed by information. We published the book n=1: How the Uniqueness of Each Individual is Transforming Healthcare. The key thesis was captured very well in your book. The financial incentives and democratization of information will allow the individual to drive the transformation. The sooner health care leaders grasp this core understanding and design healthcare accordingly, the better.Thanks for a great read. Some folks are quiet rude in their responses to this blog. Our healthcare is flawed and we all know that. Try showing some respect and professionalism to the physician who has dedicated his career to patient safety. Actually, Dr Wachter’s entire op-ed is about the flaws in the current electronic medical record. I’ve not seen anyone disagree with that aspect of his blog. Dr Wachter is considered as one of the most influential “thought leaders” in American medicine today. As such his voice carries clout denied to the rest of us. The adverse comments have been directed to his proposed solutions to the problem, not to his analysis. Dr Wachter in the past was one of the avid proponents of EHR. To quote from 2005: “That’s really where the breathtaking potential of this comes from, in not only stemming medical mistakes but also improving a level of quality to – to, I think, a level that we haven’t even begun to think about…I would go even further than that, which is that you can make it more private with the computerized system than the present system.” EHR was avidly pushed, (in part by medical “thought leaders”), and adopted without being properly designed and tested for patient care, but rather for coding and billing, and his op-ed piece describes this very well. The sense that most of us have is that things will get worse. In October ICD-10 will become mandatory, with 68,000 clinical modification codes and 76,000 procedure codes. How will this impact documentation requirements? In the past month I received a letter from my insurance carrier that their system had been hacked in 2014 and personal data may have been compromised – so much for enhanced privacy from the EHR. EHR has a lot of potential – for good and bad, as we have seen. After praising the airline industry for spending much time getting input from pilots and developing cockpit systems focused on the user, surprisingly most of Dr Wachter’s solutions do not suggest that this be done with the EMR. This is where I have a problem with his piece. His solutions are “changes in the way we organize our work… training students and physicians to focus on the patient despite the demands of the computers…creating new ways to build teamwork”. I wish he would elaborate on this, because it sounds like the old “work smarter, not harder” mantra and focuses the problem on the user and not the system. I fully agree we should have ” federal policies that promote the seamless sharing of data between different systems in different settings”, but if the feds cannot get their own two systems to seamlessly interact I have little hope they will be able to get this implemented across the board. His final recommendation is for ” far better collaboration between academic researchers and software developers to weed out bugs and reimagine how our work can be accomplished in a digital environment.” I would argue that an academic researcher and a practicing physician or nurse have different jobs. How much do academic researchers understand about the day-to-day problems of community practitioners who have to use the EHR? Where is the “pilot” in all this? One would hope that if an EHR system has flaws, perhaps the system could be changed to better aid the user, rather than the user being changed to deal with the system. As I said, Dr Wachter has influence, and policy makers might listen to him. He has a considerable responsibility because of this and a rare opportunity to make things better. To his credit he has asked for comments and criticism, not praise. Some of the comments regarding his solutions have been blunt, evidence of frustration with the current system but also with the medical and nursing leadership which were not able to prevent the current flaws from developing, indeed may have facilitated the current EHR system problems. I apologize if any of my comments seemed disrespectful. At the same time I am disappointed by his ideas on fixing the problems. I am surprised he has not received more comments than he has. I am a relative newcomer to healthcare (12 years) and a technologist by trade. I am presently the CIO at a relatively large (414 bed) community hospital. Your book is one of the best reads I’ve had in years, of any genre! You are “spot on”. I wish I could get my entire staff to read it, along with the entire medical staff and the senior leadership team, too. I’ve not read the doctor’s book, but it is on my list to read in my travels this coming week, I am a CIO that is forced by regulation to implment6 software that was never ready or designed to be implemented I the way it is being forced into healthcare these days, it was never built for interoperability, not for doctor or patient communication, instead IT professionals must fight for budgets to build the right infrastructures to support the needs of the clinical staff, while I agree that such tools can assist in reducing errors in health care because typed words are readable and don’t have to be translated by a clerk who can read certain physician scribble, in addition such tools can use workflows and rules to compare lab values, medications etc.,. to orders to eliminate drug lab interactions as well as many other possible errors, which worked for the most part in the old double check world of paper orders. even die heart computer haters must agree that bar coding medication using medication administration systems at the point of care reduces adverse events from reaching the patient. wrong, drug, dose or time are all problems in the paper world that should not happen in the electronic world, reducing cost and improving quality and adverse drug outcomes for patients.as the government handed down the meaningful use rules, they never stopped to think about the fact that most systems at that time could not be deployed at in a way that would meet the requirements o0r be safe in doing so, there was little experience in the industry and I believe they missed two large opportunities to change care, the only real reason to force the industry to electronic tools is to mine the data to automatically provide patient based analytics to the care providers on the right patient and for the right time in the care process and for the right reasons. analytics should be able to provide or predict which patient ware declining in health and require physician intervention, help identify septic patients and those that are risk of readmission or fall risks. I know some systems have these function after being modified i9 speaking from a place of shouldn’t all system contain basic standards of care assuming such standards exist. applications perform well when designed around a fixed set of well known issues which have standardized solutions, healthcare is nothing like this it is millions of variables and highly dependent on patient engagement and engagement as well as provider knowledge and experience some might say the luck of the draw equals a good outcome, I’ve been a lucky patient more than a few times and have experienced healthcare from the inside out having many complicated diseases, no one doctor is able to treat me care must be coordinated by someone, so I choose my primary care provider very carefully and he coordinates my care especially if I’m in the hospital, and for follow-up vests at discharge, I’m an engaged patient, if I wasn’t I would be dead by now. I asked everyone when the health system fails were you engaged in your care? did you ask questions and advocate for yourself? who knows your history better than you do? the physicians question are designed to be a quick snapshot of your health history to get them on the same page as you are or should be, today there is no promised fully integrated health record for patients or doctors, which brings me to item number two of the failures of the regulatory environment one common national patient identifier so that patient records could be safely shared with more than a 1 in 100 chance best guess of the merged information belonging together or actually belonging to you these issues exist in the same health system let alone national database, just look in the phone book for those that have names similar to yours, chances are they have a birthdate in common, may have lived near you at some time in the past etc. these causes duplicates to populate many health systems so sharing such data becomes a nightmare of effort to ensure accuracy, let alone we will need better security then the social security system has shown. if we ran a comparison of patient social security numbers I can predict there are many patients with the same social number in the system, patient that are insured have an incentive to identify themselves so hospitals can bill their insurance, those without insurance may want to avoid billing or use some other means to avoid identification, which a national identifier would help avoid both the merger of incorrectly matched records and improper billing as well as the increase in cost for the technology to assist in correcting these issues and the staff to manage these complex issues today the billing systems are so complex hospital billing departments are crowed with staff processing what the computer spits out as exceptions and insurance denials. more overhead that increases healthcare expenses, these less then add value services in healthcare such as the millions spent on unnecessary staff and expensive electronic tools that do not help make thing easier or may actually be another source of patient harm, as there are dangers in allowing care provider to be come to reliant on the technology tools because computers are programmed by humans, we get tired and make mistakes and have proce4ss problem just like other areas of healthcare, except the technology changes are deployed to all practices and providers across large health systems at the same time, the changes are almost immediately integrated into the care practice.. No word of mouth to slowly spread a bad outcome or fat finger drug dose value, with these we can spread to 100s of providers in across a large geographic area or even across the country in seconds. maybe a few providers will read the details on the order they have seen every day for the last 10 months and notice the order states 100mg twice a day instead of the normal 10mg per dose and the doctor corrects the dosing based , and corrects the problem but not before 100s of patients have incorrect orders in there hands or being reviewed in pharmacy which has also noticed a n issue and is calling doctors to verify, an old safe guard still in place thank goodness but not always true in every hospital as resource heavy hospitals down size staff to compensate for these extra millions in costs. another area of concern regarding technology tools in general which need to be monitored concerns the automation of care to much technology integration reduce ort takes away clinical staff critical thinking skills has automated to much of the care process and will harm patients sooner or later if left unchecked, I believe. A vital conversation! How to get that 25 years of death and morbidity down to 5 will be the challenge. Life is not a video game. Nobody spawns back to life in this crisis (turning point). Visionary physician leadership with gutsy test pilots who can and will stand up to corporate/government influence and lethargy. All the IT available won’t be truly appreciated until it is so unobtrusive that no one realizes it is there, taking notes as we talk or take readings. Yes, it is a hard path, but as had been said, easy is hard to do.